Some studies estimate that over 70% of high school seniors leave the church upon graduation! There is no denying the emergency. The statistical nightmare is obvious. We are losing our kids. When I began working with young people more than 30 years ago, church growth experts estimated that approximately 45% of high school seniors left the church upon graduation. That statistic shocked me then and the tragic numbers continue to drive my ministry to this day. Change must come immediately! But, that being said, it is unrealistic to expect results to come at the same pace. There is no quick fix. It has taken us many years and multiple generations to arrive at such an emergency. It may require the same to get us out. Patience, perseverance, and persistence are essential. Over the last 3 decades, I have given a great deal of thought and prayer to this subject. I have been blessed to travel from coast to coast, speaking on this tragic trend, as well as write several books about the biblical solutions. 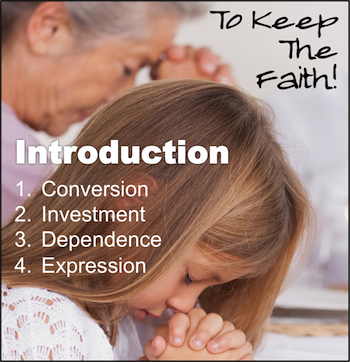 Please check out our latest eBook entitled, "To Keep the Faith!" Below is a brief overview of the four sections within this publication. They are also the lessons I present as a 4-part seminar. Can I come to your congregation? The entry point of grace is nothing less than traumatic. In order for young people to experience true conversion, and thereby make a lasting investment in the church, they must first count the cost. They must be taught the price of sin, the pain of sacrifice, and the necessity of self-discipline. This section includes a quick study of Romans 15:1-6 followed by a study of several expressions of worship. After each biblical example, there are questions to help young people identify their functionality within that area. To be effective mentors, adults must take young people to these passages and let them discover their own function and, thereby, make an investment in the church. When a church family only comes together three times a week to engage in formalized, pre-scripted meetings, intimate bonding is unlikely to occur. Without that bonding, young people are not likely to make long-term investments in the group. If mentors will create a spiritual social network on which young people are dependent, their loyalty to the church WILL be the result. Many have wrongly concluded that the only way to remedy the mass exodus of young people from the church is to make the worship service into a circus. I passionately challenge that conclusion. They are not asking for a circus, they are simply looking for conviction. Our young people see too many grandfathers who do not sing during the song service or grandmothers who write their contribution checks while the grape juice is being passed. Too many fathers take time off from work to go on vacation, but refuse to take time off from work to go to church. Too many mothers are more concerned about their child’s homework than they are about their child’s assignments from Sunday school. The young people are watching. They expect more than just empty words and heartless expressions. Before they give their lives to Jesus, they want to know how He has changed our lives. Does it show? Are we convicted? Take a minute and consider your own congregation. What is the average age of the membership? How many young people can you name who grew up there but are no longer faithful to the Lord's church? Now consider the churches around you. How many can you list that have either closed their doors or are on the verge of doing so? Unfortunately, the evidence is all around us. We are losing our children and the future looks very bleak, if we don't do something immediately. "To Keep The Faith! True Conversion"
"To Keep The Faith! A Surgery at the Hands of Christ"
"To Keep The Faith! A Healing from the Holy Sprit"
Back to Top of "To Keep The Faith!"